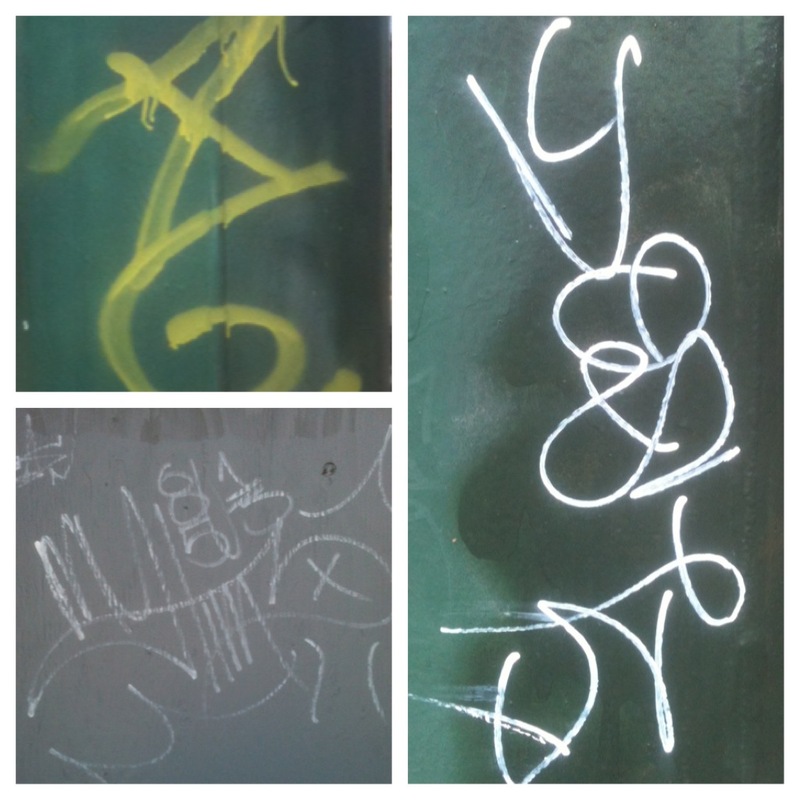 Anyone who’s read a few of my posts must sense an underlying obsession with scribbled graffiti. It feels like annoying visual noise buzzing through my head when I’m out walking the dog. In my best agitated curmudgeon state it seems like a blight openly screaming that vandals have no need to consider people’s property or businesses, that it’s their right to make nasty, meaningless ribbons of paint wherever they want because no one seems to care. I’m heading into Travis Bickle territory with that last sentence, but I don’t see graffiti getting cleaned up or painted over often. It hangs around not looking like much. I can’t help but look at it, feel curmudgeonly feelings towards it and dream about living in a scribble free world. I wish the scribblers could have gotten it out of their system when they were babies. I had a flashback to a religious pamphlet a guy handed me downtown. 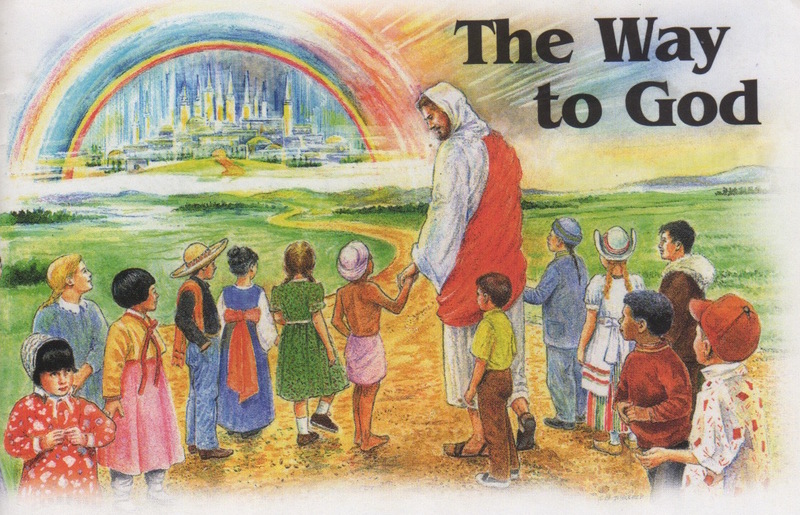 The cover had Jesus and a group of children from many different nationalities in their native garb approaching a glowing, crystal city with a giant rainbow over it. I’m guessing there’s no graffiti in that place. I’m sure people can defend it and call it street art. I look at it and most of the time I grumble. I’m grumpy. I just paid my Arts Tax, and my household payment of 70 bucks puts a dent in my anemic budget. I would have preferred to go out with my wife and have dinner with some money left over to support an art event. I do like knowing that the money is going to hire teachers and I want to support art, but I want to complain more. Buy the kids some canvas with some of that art tax. Let them make indoor art. I was around mile 7 of a 9.5 mile bike commute home from a substitute teaching job. 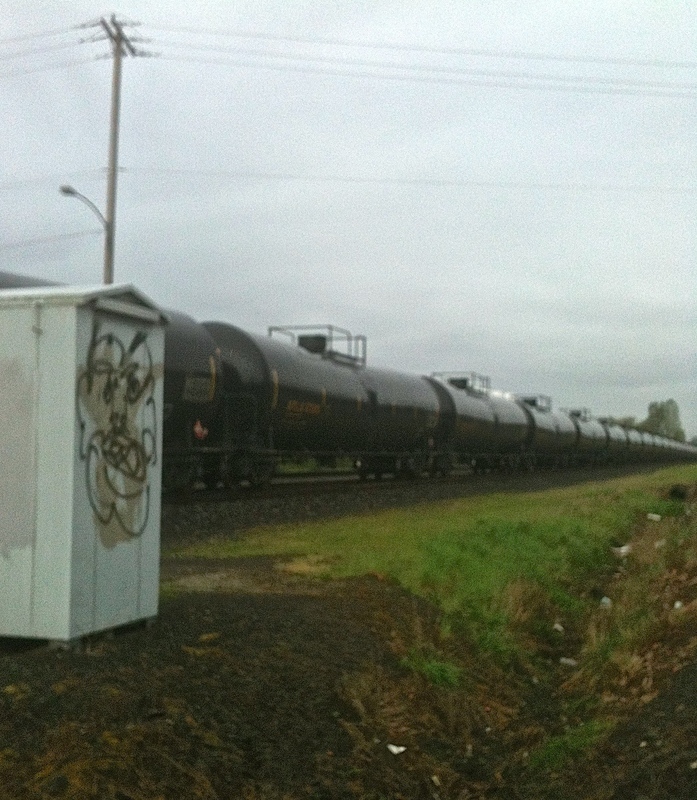 My route from Southeast Portland had me heading to Lombard Ave to hit the bike path and ride along the railroad tracks. It started raining in the afternoon and I hadn’t thought to pack rain gear. The Bison Coffee House jumped out at me like an oasis so I stopped to drink coffee and warm up. By the time I got along the railroad tracks the rain started back up. I was getting soaked and in no mood to stop. I had seen some old school multi-colored subway train graffiti on a cement underpass, but it was too hard to reach. When I saw the scribbles that made a face the part of me that wanted to check it out overpowered the part of me that wanted to get home. I’ve ranted about scribbles that make no sense to me but these scribbles captured my harried, soaked to the skin, dampened spirits. I was looking at about as much art as you can get out of a spray can. 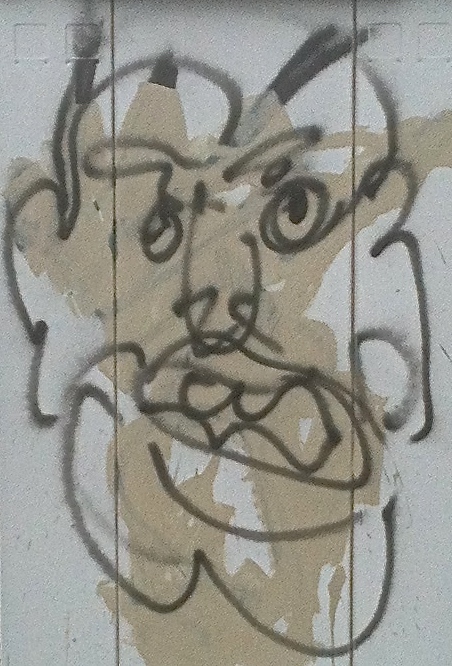 The mouth, the grimace, captured the spirit of life along the railroad tracks. It took scribbles to a whole other level. There was movement, meaning and great energy. I could overlook the vandalism aspect because I saw art and when you’re riding a bike down Lombard Ave with cars whizzing by and rain in your face a little art takes the misery out of the whole endeavor. 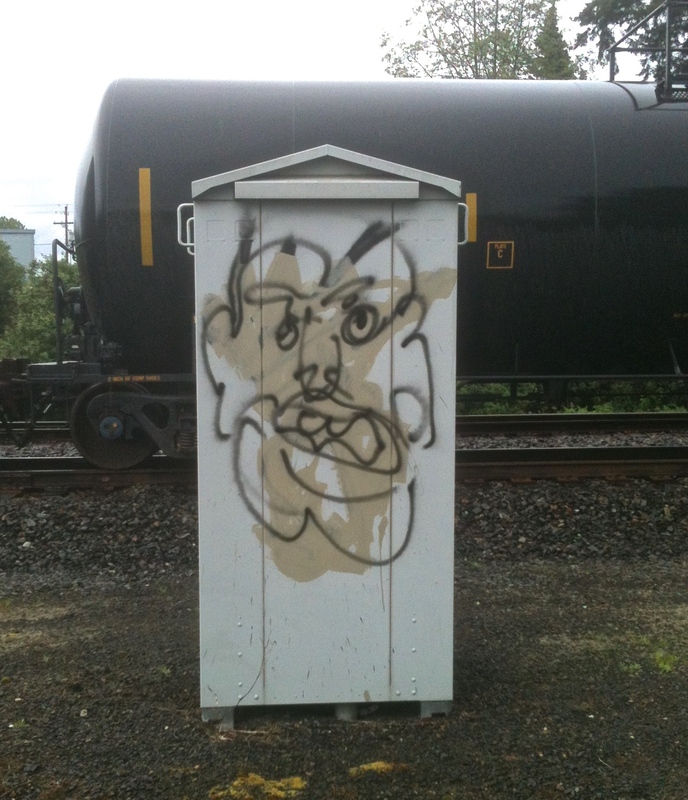 The Portland Orbit editorial board wishes to make the following statement: We’re asking that David Craig acknowledge that he is not promoting vandalism and that if he wishes to continue writing about graffiti it will be for the purposes of documenting it and not promoting it or encouraging it in any way. And by documenting it he will also refrain from harping on how much it annoys him.